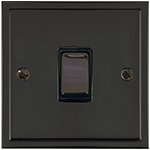 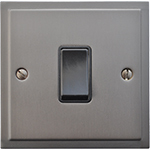 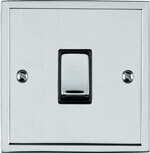 Elite Stepped Plate is an elegant range of electrical accessories featuring flat plates with an attractive stepped edge and contemporary square profile. 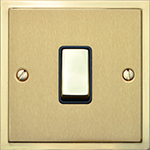 Offering minimal projection this unique range provides a stylish alternative to traditional flat plate designs. 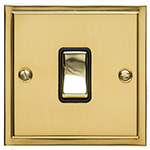 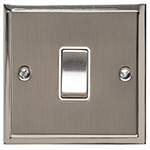 Competitively priced Elite Stepped Plate is available in a choice of luxurious finishes which includes Polished Brass and Polished Chrome together with Satin Brass, Satin Chrome and Satin Nickel dual finishes with polished edge. 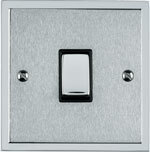 Matching metal rockers with a choice of white or black trim lend a touch of sheer elegance. 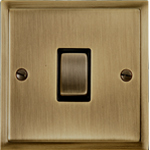 Elite Stepped is the ideal design choice to compliment modern decor schemes.